Mike Kiedrowski was not a complete unknown when he stunned the crowd at the Gatorback AMA Motocross National in March of 1989, but let’s just say moto-journalist were still trying to figure out how to spell his name when he made headlines with an unexpected victory in the 125cc National that day. By the start of the 1989 season Kiedrowski had shown enough potential racing with Kawasaki Team Green support to earn a factory ride with Honda. But when you strictly look at it on paper, his accomplishments in the pro ranks up to that point were relatively thin. A trio of podium results in AMA 125cc Regional Supercross and twice runner up in 125 SX (once in West and once in East) was his claim to fame. Thin or not, when the ’89 season kicked off Kiedrowski suddenly found himself a factory Honda rider. Kiedrowski was pegged by most experts to serve a factory apprenticeship in ‘89. While he was being paid by the factory, he was really a B-team member, along with Guy Cooper and Larry Ward. Kiedrowski recalls he wasn’t getting all the trick HRC stuff that George Holland was, but on the plus side, he was getting suspension and motor help from Mitch Payton. From the sidelines it would be easy to mistake him for a rank privateer or local rider with his Honda sporting the number 762. A lot of people have wondered over the years, why was a factory rider, who had twice finished runner up in AMA 125 Supercross was running 762? Turns out the answer was pretty straightforward. “When I got my AMA license that was the number that was given to me,” Kiedrowski explains. He would certainly do the three-digit number proud. 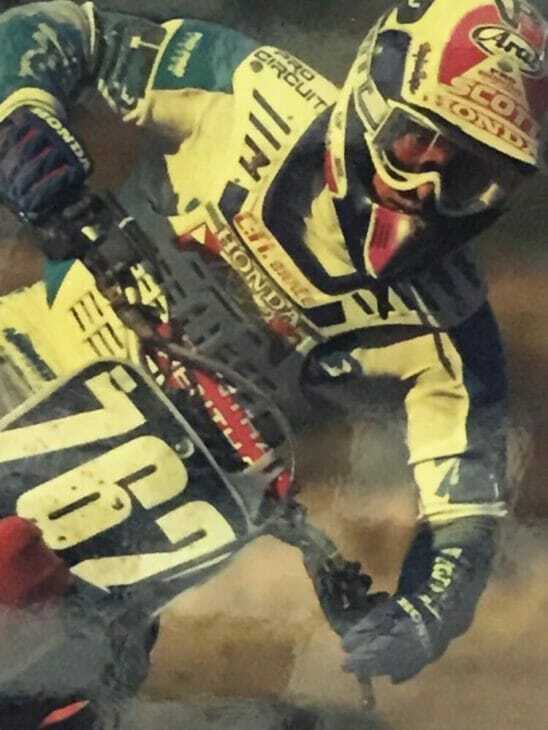 Coming into the ’89 AMA National Motocross season opener at Gatorback, there was not a lot of indication that Kiedrowski was going to be a title contender. Back then Gatorback (in Gainesville, Florida) was sort of an unusual outdoor national in that it ran in March, right in the middle of Supercross season, normally the weekend before the Daytona Supercross. Kiedrowski was racing 125 East Supercross that season and there’d only been a couple of those rounds of that series before Gatorback. Kiedrowski finished fifth at Miami and third in Atlanta Supercross 125 East rounds, but keep in mind most of the rest of the West Coast 125 Supercross riders would also be coming over to race the 125 National at Gatorback, so by all rights, based on his SX results, you might expect Kiedrowski to finish somewhere from fifth to tenth in the MX opener. At the start of the first moto Kiedrowski was behind all his Honda teammates, with 1988 AMA 125MX champ George Holland leading on the A-team Honda ahead of a three-way battle for second between the other Honda factory riders Cooper and Ward and highly-touted rookie Damon Bradshaw on a Yamaha. Kiedrowski was well back, just inside the top ten battling with Mike LaRocco and Tallon Vohland. Bradshaw held off Ward to score the first moto victory, a rarity for a rookie. Late in the moto Kiedrowski followed LaRocco, who’d been gradually working their way up, passed Holland. That put LaRocco third and Kiedrowski was fourth in his first moto as a factory rider and he was satisfied with that. In the second moto Kiedrowski got a lackluster start and ran eighth. But then he started getting into a rhythm and a fast one at that. Holland slid out in from of him and “Kied” moved up a spot. Then a lap later he zapped moto one winner Bradshaw to take third behind Ty Davis and Cooper. For a couple of laps Davis, Cooper and Kiedrowski thrilled the crowd with a battle for the lead, but then Kiedrowski kicked it into overdrive, took the lead and quickly pulled away. At the checkered flag he enjoyed a 14-second lead! Bradshaw crashed and could only recover to ninth. And Larry Ward, who’d finished second in the first moto, suffered a DNF when the chain on his bike kept falling off due to a bent chain guide. That meant Kiedrowski’s 4-1 gave him the overall victory ahead of Bradshaw and Cooper. Kiedrowski surprised not just the Gatorback crowd and his fellow competitors, but even himself by coming out of the box with a victory. Looking back, Kiedrowski thinks a key ingredient that helped him win in his first outing as a Honda rider, was a week-long practice session he’d had with Rick Johnson earlier that year. Even after scoring the win in the season opener, few believed Kiedrowski would go on to win the championship. Throughout the summer he was consistent, but it was Bradshaw and Holland scoring most of the victories. Then came Washougal, seven rounds later, where Kiedrowski finally won again and proved that Gatorback was no fluke. Kiedrowski won again at Budds Creek in the penultimate round, but the championship was still up for grabs going into the season finale that year, mid-October at Unadilla. Bradshaw was just points behind and even Cooper still had a mathematical shot at the title. 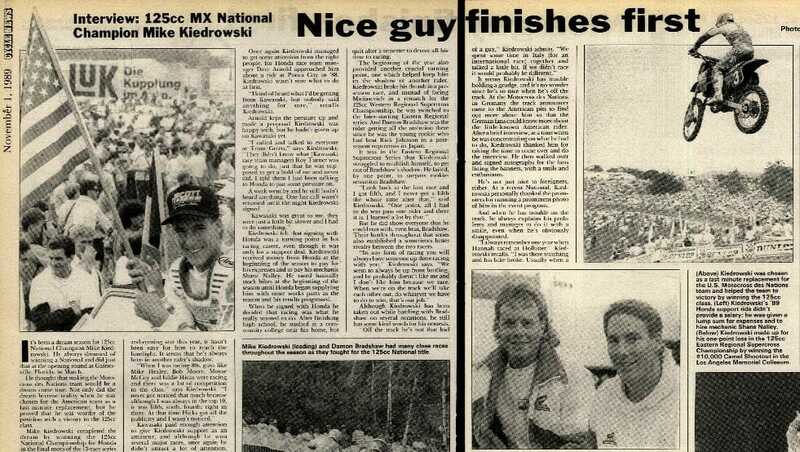 Cycle News feature on Kiedrowski after he won the 1989 AMA 125cc National Motocross Championship. Bradshaw won the first moto and to top it off Kiedrowski’s bike suffered a flat rear tire. “Fortunately, Unadilla was loamy enough and I was able to still go pretty good, even with the flat,” Kiedrowski recalls. Fast enough that he was able to pass Erik Kehoe late in the moto to finish third. Now just six points separated Kiedrowski and Bradshaw going into the final moto, so there was not a lot of margin for error. Bradshaw won the second moto too, but everything went smoothly for Kiedrowski that time around and he was able to finish second. That was good enough to clinch the championship by just three points. With all the pressure going into that championship-deciding final moto, Kiedrowski said when he clinched the title, it was more a feeling or relief than jubilation. Kiedrowski would go on to compile a Hall of Fame career, but he still looks very fondly on that ’89 season. Larry Lawrence | Archives Editor In addition to writing our Archives section on a weekly basis, Lawrence is another who is capable of covering any event we throw his way.